« Nov. 5, 1968: The sounds of silence. Yesterday, we mentioned Richard Nixon on Election Day 1968 as one of only two political candidates to be mentioned on my grandfather’s calendars. The other? Well … the odds are good you wouldn’t have guessed, unless you spent time in Stamford, Connecticut, in the 1970s. 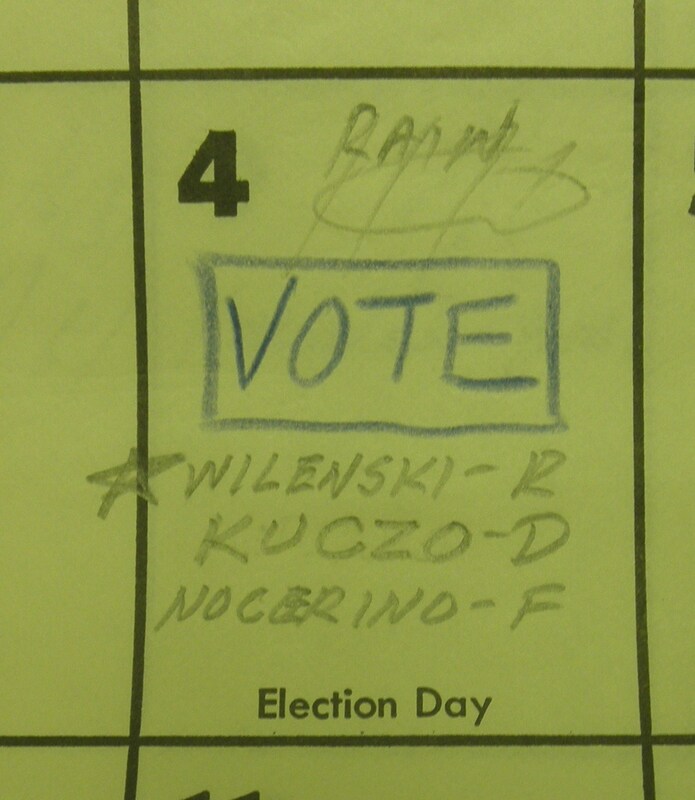 This is actually three candidates’ names — and one of them, my grandpa’s pick, is misspelled. Wilensky won, and served two terms as mayor between 1969 and 1973. Coincidentally, he appears on the same front page of the Stamford Advocate mentioned in yesterday’s entry. The story is about Wilensky, an avid yachtsman, steering a 157-foot Coast Guard cutter into a slip as part of the city’s Fourth of July festivities. Kuczo and Nocerino, meanwhile, filed suit after the election against a company called Western Connecticut Broadcasting, claiming the company unfairly censored their advertisements while rubber-stamping those of Wilensky. The case was not decided until October 1977 in federal circuit court, and appears to have been judged in favor of the broadcasting company. Those who enjoy legal wrangling can learn more here. Guess Pop was a dyed-in-the-wool Republican, as John Nocerino was an energetic member of the Springdale Methodist Church to which our family belonged, just diagonally across Hope Street, and lived in a big ol’ Hope Street house within spitting distance of Dolan Jr. High School in Glenbrook, across from what is now Stamford Housewrecking. “Stamford Housewrecking” would be a great name for an R’n’B party band, trademark issues aside. Maybe it was the third-party thing that dissuaded Drawing Boy. It’s hard to get people behind you — even the people you know, sometimes — without the imprimatur of the D’s or R’s. My fav band name was always “Working Fire”. In my day local radio newscasters would every so often announce a “there’s a working fire at 7th and wherever; avoid this area” kinda thing. “Stamford Housewrecking” sounds more punk to me; “Working Fire” is just a burnin’ group!